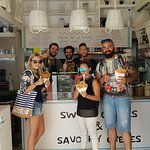 Description: For the second year you can find us at the center of Fira.This year We offer to you crepes savory and sweet ,and soft ice cream. Everything is daily handmade with fresh ingredience. We also serve coffee, 100% Arabica and speciality category, juices made with fresh fruits and delicious smoothies. We will be waiting for you!! 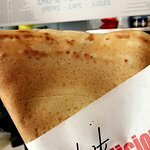 This time I ordered #9 in the savoury crepes section. #2 from the sweet crepes. 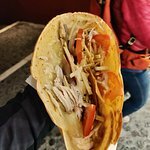 The savoury cpepe was excellent and filling. 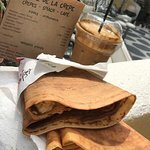 The sweet crepe was exactly what I epected. I ordered a Freddo Cappuccino med. sweet and it was just right. I alos ordered a smoothie. (Mango, Pineapple, fresh yogurt, honey) It was a little lighter in flavor than I expected but it was my first smoothie. 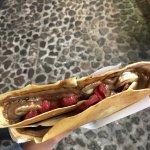 I had a delicious chocolate and strawberry crepe from here whilst in Fira. The menu has so many options to choose from or invent your own. 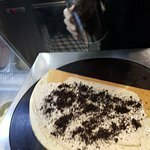 Quick service, reasonable prices, but if you’re anything like me find somewhere to sit to enjoy your crepe or you’ll end up making a mess and dropping chocolate all over yourself!! 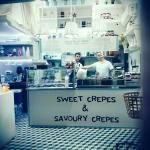 If your looking for a crepe or coffee in fira these guys are the answer. Firstly the coffee we went to a shop close to the cable cart. And charged €8 for our freddo'S We went to these guys and got 2 for €4 and they were just as good. We had several in our time. The crepes my partner got one from crepe house which is round the corner and was very poor. So We tried here white chocolate and oreo. It was a work of art a and very cheap. enough chocolate spread to give us both diabetes but Christ it was good. Think we had two by the end of the week. Staff were great started to recognise us and greeted us as we went by. 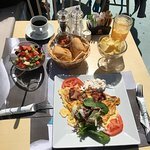 Great location and friendly staff but absolutely tasteless crepes. A salmon sandwich was served with chips from a pack. Strange combination. Overpriced dishes - no value for money. Should think about improving the taste of dishes they serve. I called in my order. The person who answered was friendly and helpful. The food arrived quickly and it tastes delicious. I will order again and again and again...I ordered the #13 in the savoury category and #2 in the sweet category. I also ordered a Freddo Cappuccino. 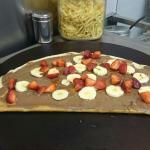 Been to Creme de la Crepe? Share your experiences!